Hotel Beranek continues its tradition of the last century, when it was well known for its high standard of accommodation and services. Newly opened, with 80 air-conditioned rooms. Each with private bathroom, SAT-TV, refrigerator, safe deposit box and hair dryer offer pleasant rest in busy Prague. All rooms are equipped with free high speed InternernetWiFi. One room is specially equipped for physically disabled persons. 12 garage spaces are available for hotel guests. Breakfast is served buffet style. 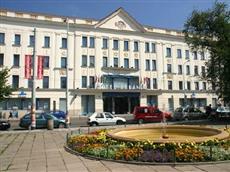 The hotel is situated on Tyls square just 3 minutes from Wenceslas Square (i.e. from the real centre of Prague). Bus and tram stops, and the metro station are just a few steps from the hotel. The hotel is also conveniently accessible by car from the road.